We loved working with beautiful, Peruvian designer, Betsy Cohen. She is a new mother and the founder of Zophia, an online store for custom CEO skirts and business attire for women. Her attention to detail and taste for quality material, made it easy to choose from one of her custom made pieces for the shoot - her wedding gown! We really enjoyed working with Betsy and we were all ready to make her feel like a princess for the afternoon. She shared with us that she didn’t even remember the last time that she had looked in the mirror ever since her little boy was born. 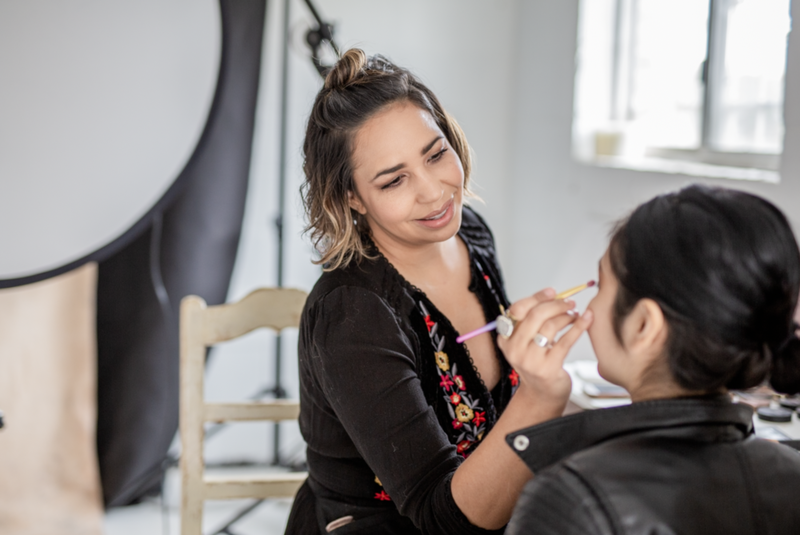 Leslie, our joy-filled makeup artist, was thrilled to pamper her and dust her eyes with beautiful browns and golds to compliment her gown for the shoot, but not be too distracting from Betsy’s natural skin tones. We designed a lid that was simple, yet moody, bringing out the warmth in Betsy’s skin. Leslie added false lashes so that they would be more pronounced and dramatic in the shots we were about to take. Mae was our assistant for the day and her love and energy is contagious, just like Leslie’s. It’s so easy to be in their presence. They make you feel as though you’ve been best friends for years. Their enthusiasm and excitement of the shoot permeated the studio. It didn’t take long for “tired & exhausted” Betsy to morph into the powerful, resilient woman she is. It shined in her photos and we were screaming and jumping with happiness as her glow was shining through the camera screen! The backdrop we used was hand painted by me over a course of 3 days. I wanted to have something that wasn’t overpowering her gown, but complimented both her skin and the golds that were embroidered in her wedding dress. We reused her veil like a neck scarf which we had both girls toss and wave through a fan to give her a whimsical, ballerina vibe in her main shot. We laughed and danced to Rhianna on the playlist while clinking our glasses filled with sparkling cider. Are you a mother that’s needing a few hours to feel rejuvenated and pampered? Don’t hesitate to treat yourself to a portrait service that caters to your needs. You’re allowed to to feel beautiful and take a break.